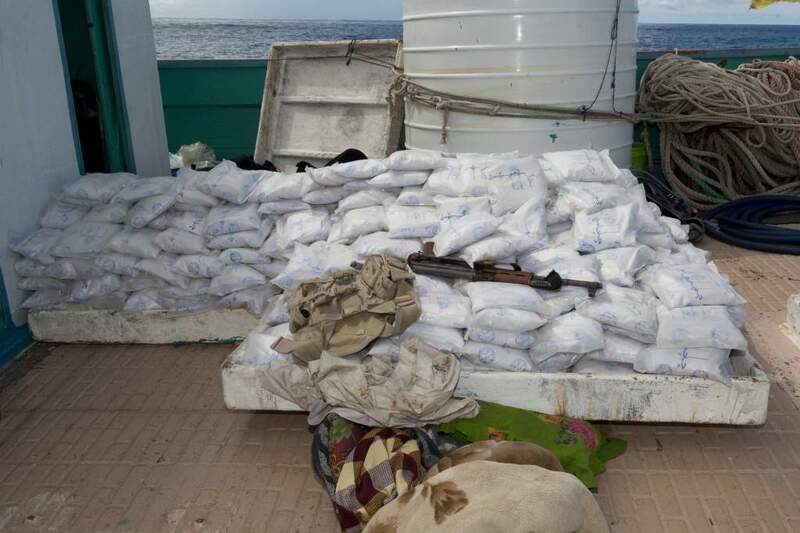 The multinational Combined Maritime Forces (CMF) successfully disrupted a massive heroin shipment on Friday as part of a highly-focused counter-terrorism operation. Canadian warship HMCS Toronto made the seizure after boarding a suspect dhow on the high seas in the Indian Ocean off Zanzibar Island, Tanzania. When the crew searched the vessel, they found almost 500kg of heroin stowed in hidden compartments. HMCS Toronto is currently under the command of the Australian-led Combined Task Force 150 (CTF150) – one of the CMF’s three maritime task forces – who coordinated the operation. 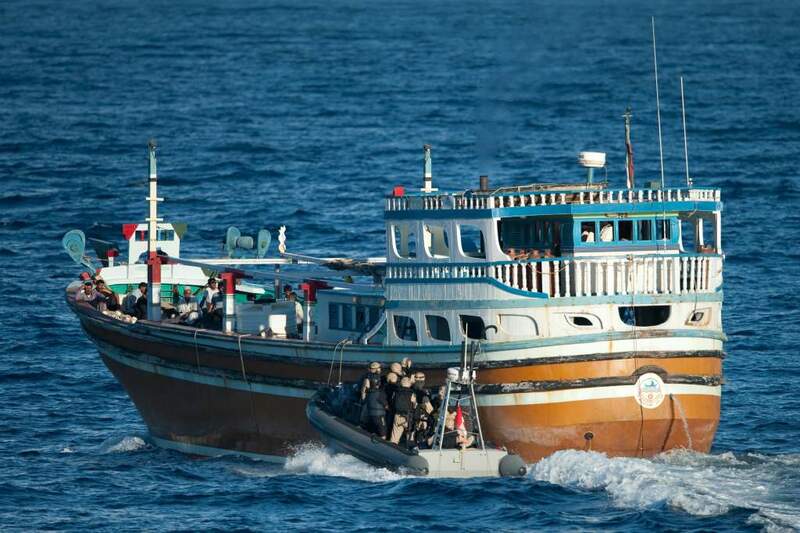 CTF 150’s Commander, Commodore Charles McHardie of the Royal Australian Navy, said that this seizure is proof that coordinated efforts can have a significant impact on narcotics smuggling, thereby denying a source of funding to terrorist organisations. “I have been advised that the heroin involved has a street value of in excess of AUD$100 million [or USD $104 million],” Commodore McHardie said. “Seizing such a huge haul is significant on many levels,’ Commander David Patchell, Commanding Officer of HMCS Toronto said. Commander Patchell and his crew have been commended by the Canadian Minister for National Defence, Peter MacKay, for their efforts in making the streets of Canada safer. The Deputy Special Agent in Charge of the United States Naval Criminal Investigative Service (NCIS) Transnational Crime Unit’s Middle East Field Office, Brian Curley, working with CTF150 on the operation, said ‘Law enforcement agencies can confirm that this is one of the largest maritime seizures of heroin in history. “Through our collaborative work we know that the global and regional terrorist organisations who threaten all of our security finance their activities with proceeds from narcotics trafficking. 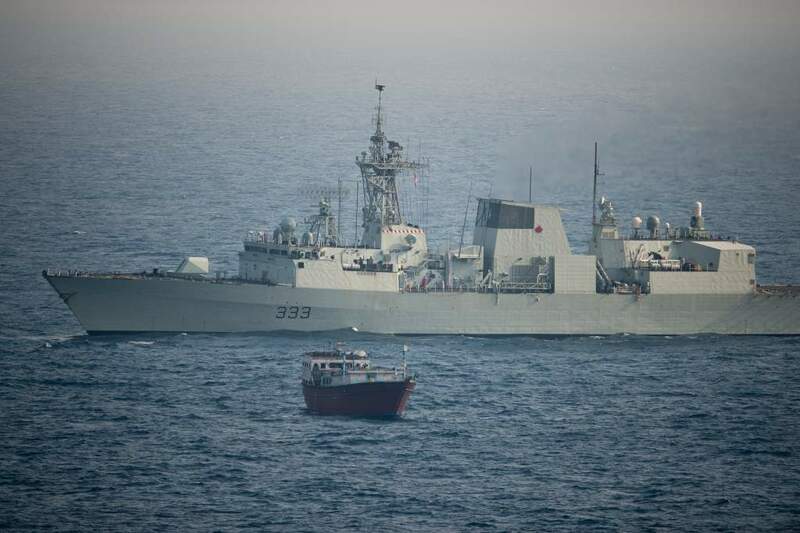 The naval boarding party from HMCS Toronto boarded the vessel in accordance with international law and subsequently found the drugs hidden in 500 bags which had been hidden throughout the ship. Operation Southern Sweep has focused on disrupting the movement of significant amounts of heroin from Afghanistan into East Africa by sea. HMCS Toronto and Australian frigate HMAS Toowoomba have been operating in support of Southern Sweep off the coast of Tanzania for over a week tracking and boarding suspect drug smugglers. “HMCS Toronto was positioned by CTF150 based on narcotics-related intelligence and historical patterns of smugglers in the area. Toronto’s tactical exploitation of this information has paid off,’ Commodore McHardie said. “We are fortunate that HMCS Toronto has also had the assistance of an embarked Seychelles Coast Guard officer and a special agent from NCIS at this crucial time in our operations. CTF 150, a combined Australian and Canadian staff, is one of three task forces commanded by the Combined Maritime Forces (CMF), a 27-nation partnership that promotes security, stability and prosperity across the Arabian Gulf, the Gulf of Oman, the Red Sea and the Indian Ocean. The area encompasses some of the world’s most important shipping lanes. The Deputy Commander of the Combined Maritime Forces, Commodore Simon Ancona, Royal Navy, said: ‘This significant achievement highlights the effectiveness of our multinational force. This significant seizure comes just two weeks after the HMS Northumberland’s disruption of cannabis smuggling activities off the coast of Oman during CTF150 operations. On Friday 15 March 2013 the British warship boarded two vessels that were carrying an estimated USD$8.2 million of cannabis resin. A helicopter from the HMS Northumberland observed the crew jettisoning their cargo as Northumberland approached. Northumberland intercepted and searched the suspect vessels on the high seas. The cargo that was recovered from the sea and seized from the vessel was destroyed. The smuggling of narcotics in the region is a recognised funding source for terrorist organisations. By interrupting the activities of drugs smugglers, CTF150 is able to deny financial resources to extremist groups.